YORKSHIRE LIFE AQUATIC are staging a hard hitting exhibition at the Leeds ST JOHN’S CENTRE next month. 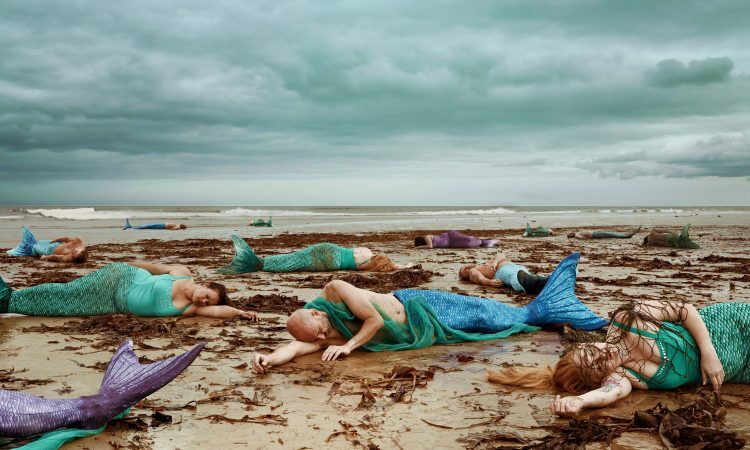 The HUMAN AQUARIUM will look at the world through the eyes of sea creatures, using ‘mer-folk’ in place of marine mammals, delving into the world of aquariums, their inhabitants and the pollution caused by single-use plastics. RICHARD HORSMAN reports. Yorkshire Life Aquatic have been a part of the arts scene round Leeds now for six years; Lucy Meredith and Zoe Parker first set up a synchronised swimming group, performing in pools and smiling through the cold in public fountains, their polka-dot swimsuits, sunglasses, colourful hats, nose clips and retro soundtrack treading a fine line between celebrating and sending up the culture of poolside glamour from Busby Berkley and Esther Williams to the Beach Boys. That evolved into dry land synchonised swimming, with the same chic iconography adapted for cabaret performance on stage, dance routines choreographed with parasols and rippling blue cloths probably more suited to the Yorkshire climate … and certainly suitable for a bigger range of venues. But for Lucy and Zoe, there’s a darker side to sand dunes and salty air; out there in the real world, animals are dying in their natural habitat from the growing impact of humans and their plastic waste. Other creatures like orca whales, with brains bigger than ours and, just possibly, a greater capacity to feel pain and emotion are kept in captivity, forced to perform stunts over and over for the amusement of human families in marine theme parks. The exhibition, to be staged in an empty shop unit in the St John’s shopping centre will contain thought provoking photography, artworks, installations, films and interactive activities developed by local Leeds artists and activists. During the exhibition the group will be creating The Forever Octopus – a sculpture made entirely from single use plastics that individual visitors and school groups will help build. 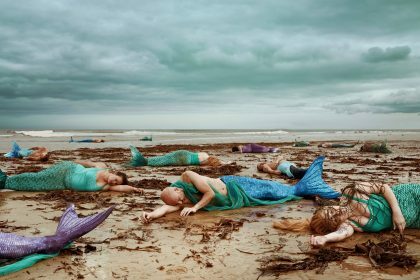 I caught up with Lucy Meredith and Zoe Parker as they prepared for the exhibition which will include stark images of ‘mer-folk’ .. male as well as female fishy humanoids .. stranded on beaches and caged in tanks, desperate to be free. Despite the success of documentaries such as ‘Blackfish’ and ‘Blue Planet’ that provide information about captivity, single-use plastics and recycling, the group questions whether we really know what we are buying into when we purchase a disposable bottle of water or a ticket to a marine park and whether we consider how our choices affect the planet. The Human Aquarium is a free, family friendly, interactive event. Volunteers will engage with visitors and discuss these hot topics, present sustainable alternatives and provide opportunities to learn about more ethical choices. The Human Aquarium is open from 15-28 February in the St John’s shopping centre, Leeds, and is funded by Arts Council England and Leeds Inspired. On the 22nd February from 6-9pm organisers are hosting an evening of environmental themed talks from organisations including The World Cetacean Alliance, Plastic-Free Me, Greenpeace Leeds, Love the Oceans, Zero Waste Leeds and The Real Junk Food Project.